Wheat Berries with Asparagus, Kale, Peas, Feta and Fried Egg. Yes, it’s that time again… Kale bouquets! If you are new to my blog, let me explain… I harvest my kale in the morning when it is cool and stick the leaves in a vase or glass of water to keep the kale fresh and crisp. And, it is fun to look at in my kitchen all day. 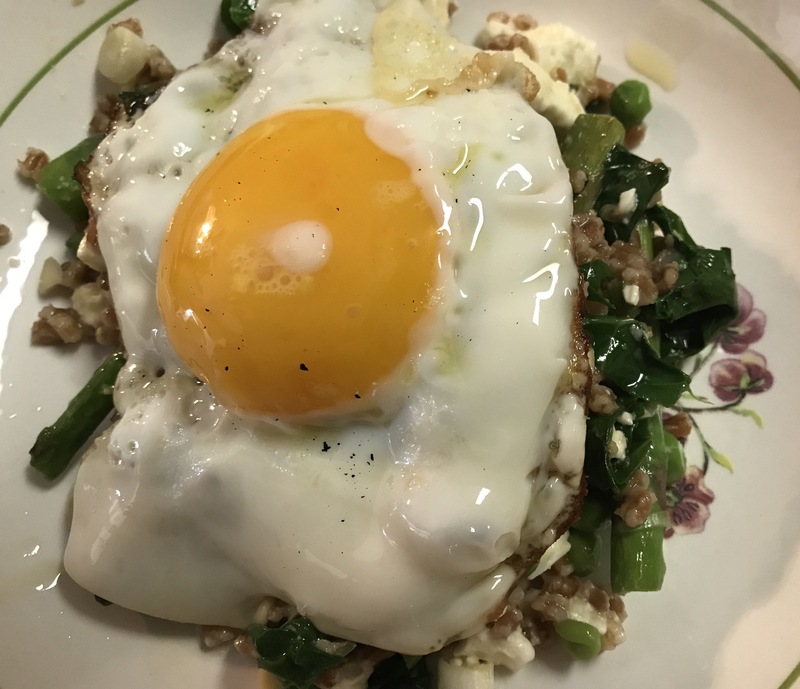 The other stars of this dish are the asparagus, the wheat berries (I love wheat berries) and, of course, Farmer Kim’s eggs. Each gets cooked on its own and then are brought together to make a delicious light and fresh dinner. Oh, of course, I shouldn’t forget the feta. We all agreed that our favorite part was when we would get a burst of feta flavor – it brightened everything! Heat 2 tablespoons olive oil in a Dutch oven until shimmering. Add 2 cups of asparagus and chili flakes, and cook until lightly browned, about 4 minutes. Season with salt and pepper, remove from the pot and set aside. In the same pot, add the wheat berries and stock and bring to a simmer. Cook until wheat berries are tender, about 20-30 minutes (check them after 20 minutes, you don’t want to overcook them and end up with mushy wheat berries). Drain the wheat berries and transfer to a large bowl. While the wheat berries are cooking, in a medium bowl, whisk together 4 tablespoons olive oil along with the lemon juice and mustard. Season with salt and pepper. Put the peas and kale in the pot with about a teaspoon of olive oil and cook over medium-high heat tossing, until the kale is wilted and peas are tender. 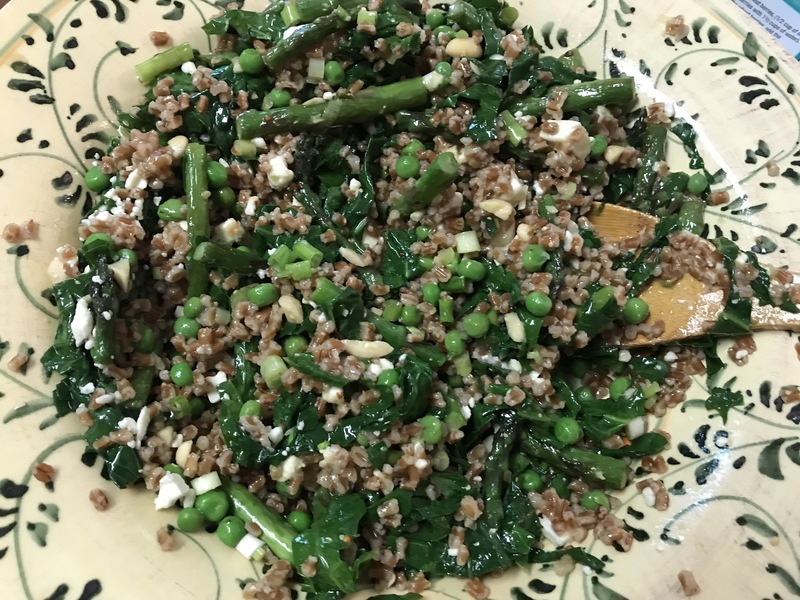 Fold vinaigrette into wheat berries, add the kale, peas, asparagus, almonds, scallions, and feta. Let stand while you cook the eggs. In a large skillet over medium high heat, heat the last 2 Tablespoons of olive oil. Fry the eggs until the yolks are just cooked. To help the yolks cook a bit faster, you can spoon some of the hot oil from the skillet onto the yolks. Serve the wheat berry salad topped with an egg and enjoy! Yes, please. This looks delicious and so fresh!